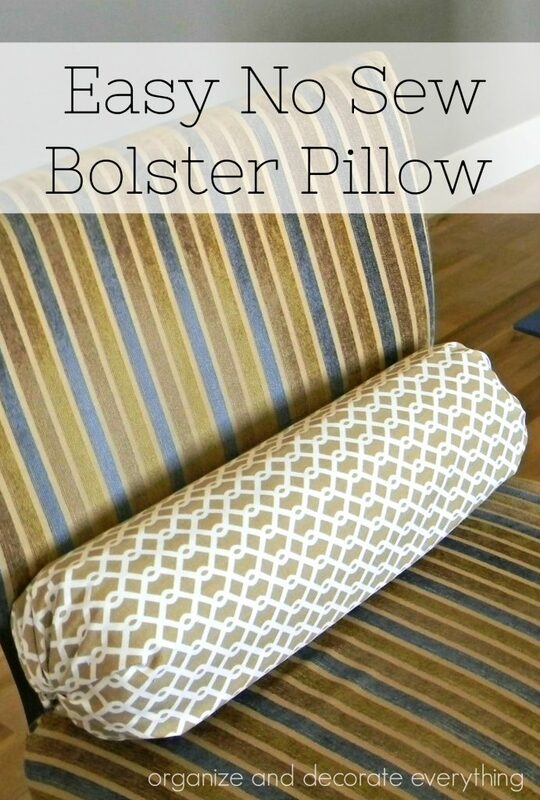 Make this easy No Sew Bolster Pillow in just a few minutes. Most of us like changing our home decor from season to season or year to year but it can be costly and time consuming. I like to think of ways to save money but still be able to redecorate as often and as easily as I like. 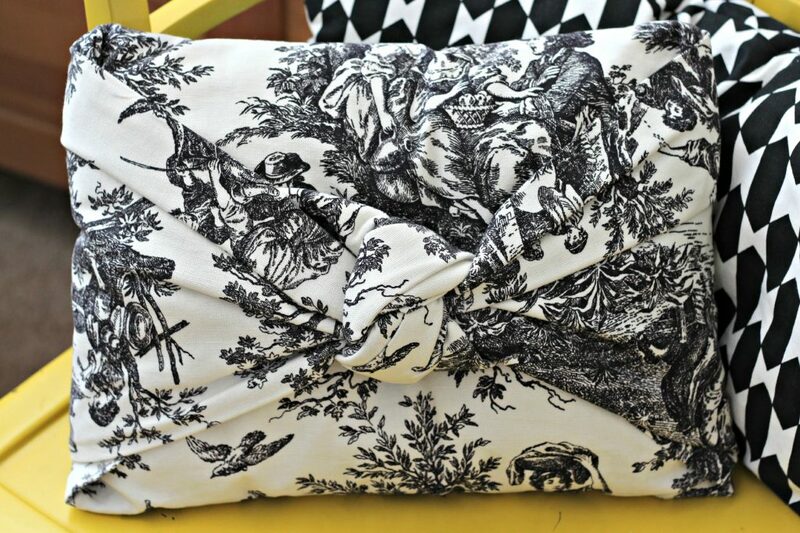 Pillows can make a big impact for a small cost especially if you get the fabric for a good price. 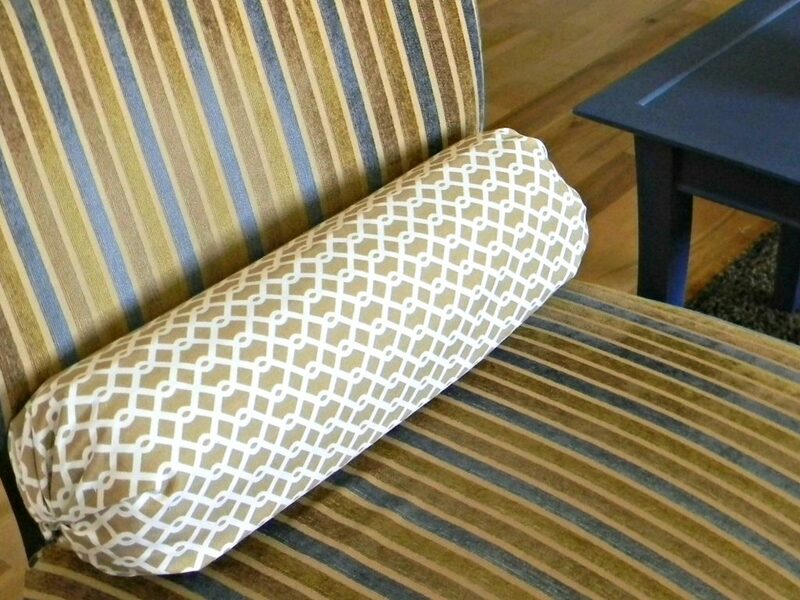 This no sew bolster pillow is quick and easy to make with little cost. 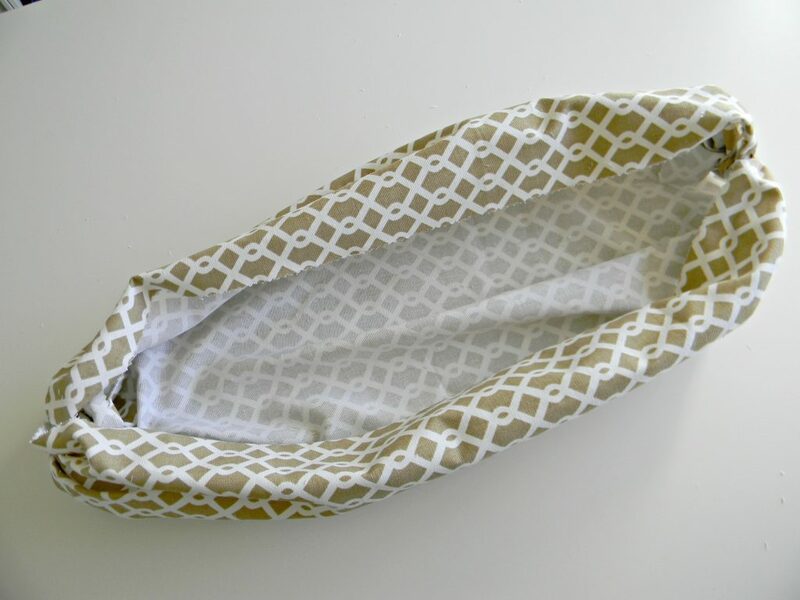 You will need 2 pillow forms, one yard of fabric, and 4 elastic bands to make 2 pillows. 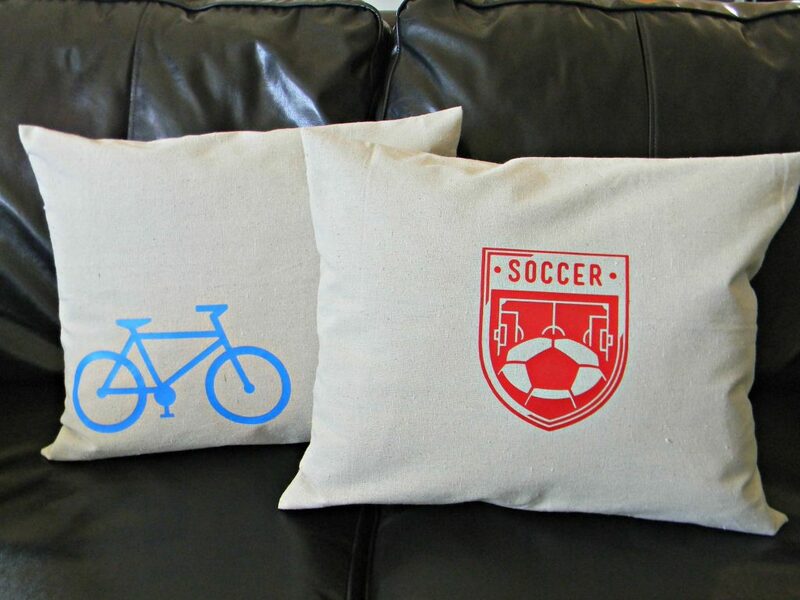 I did no sewing, gluing, or ironing on these pillows but if you would like a more finished look you could sew or use stitch witchery on the folded edge. 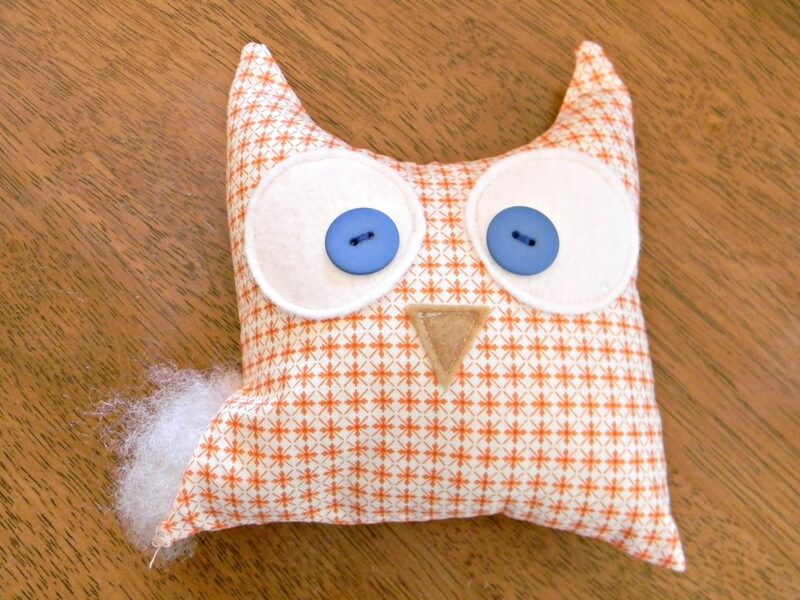 Since you start with one yard of fabric for both pillows you will need to cut the fabric in half. 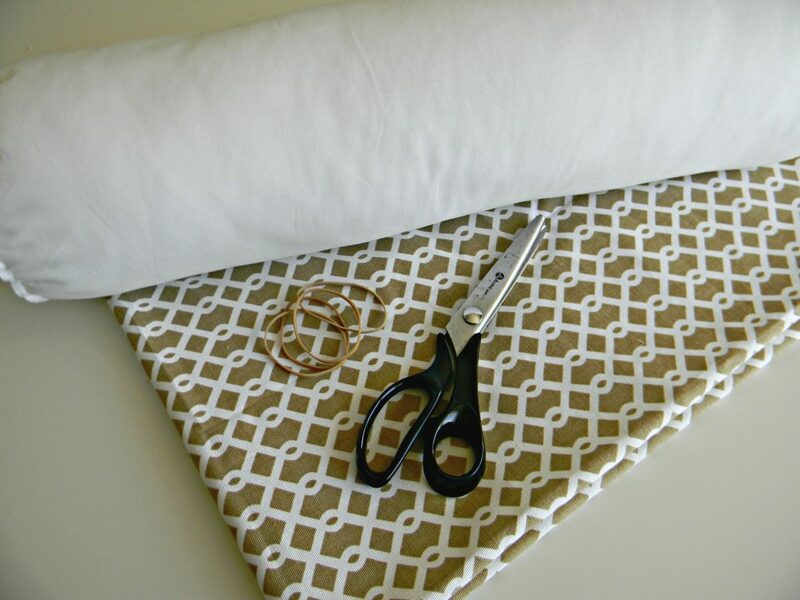 Place the form on the fabric to make sure your’re cutting it in the right direction. 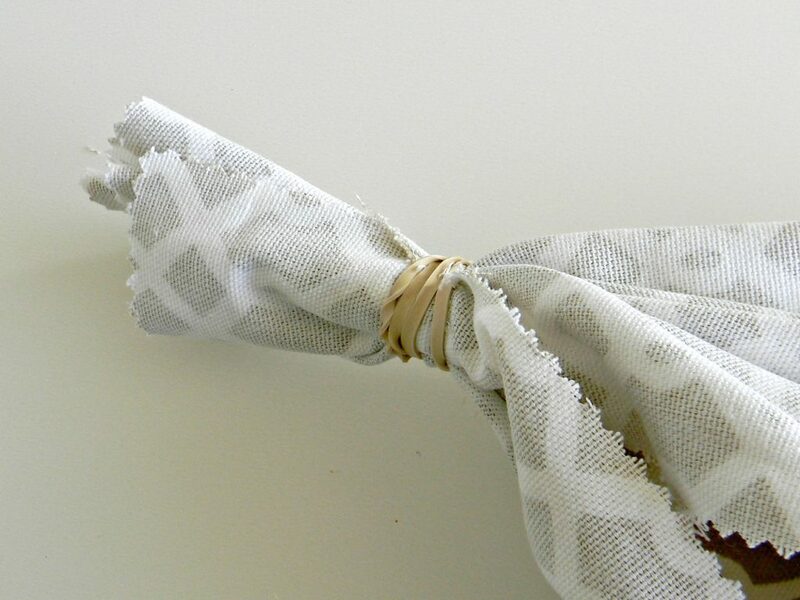 Use pinking shears to cut the fabric to prevent fraying. 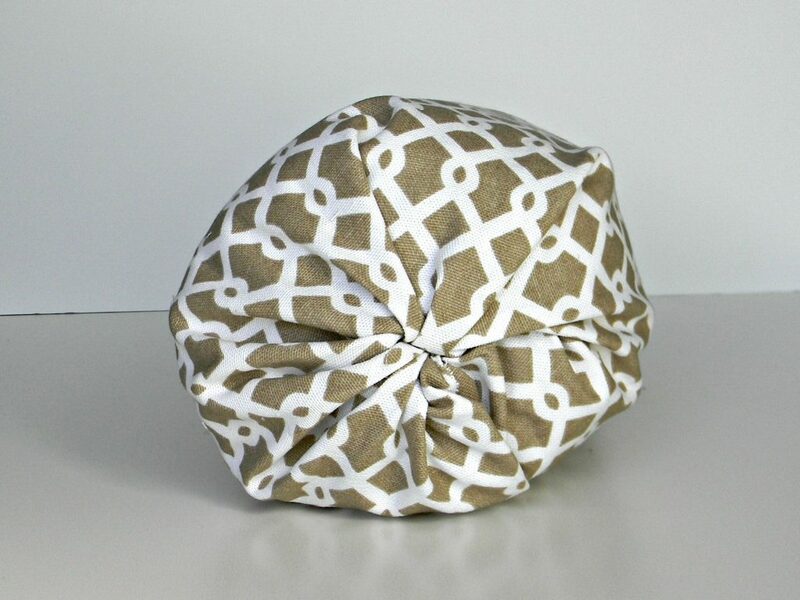 Leave 2-4″ of fabric on each side and about 4″ of extra fabric to go around the pillow form. 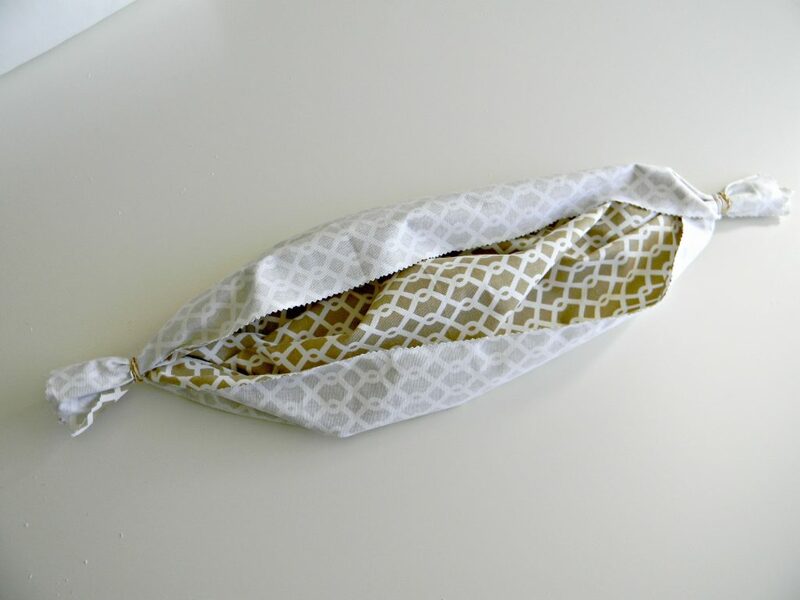 Start with the fabric wrong side up and gather one end of the fabric about 2″ from the end then wrap with an elastic band. Overlap the end over the beginning a little. 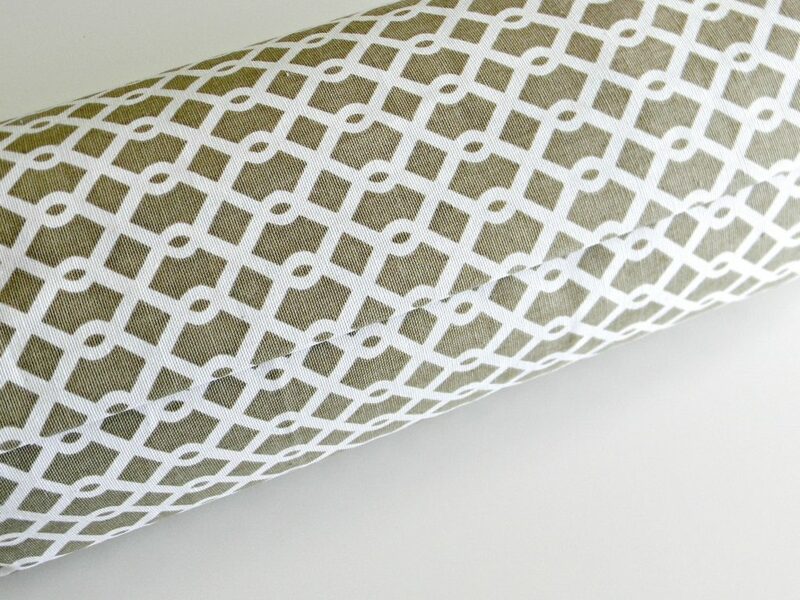 Do the same to the other end so your fabric looks like this. Now would be a good time to measure the pillow form again to make sure it will fit. Fan out both ends so it looks something like this. This will help it lay better once it’s turned right side out. Turn it right side out and place the form inside. Make adjustments to the elastics if you need too. Pull the fabric around the form spacing the fabric evenly. Turn the unfinished end under about an inch and it will overlap the other end by 2-3″. I used a heavy fabric so it stays in place really well. If you are having a problem with it staying closed you could use a little fabric glue on the folded piece. The pillow end should look like this. Wasn’t that easy? You can whip these out in no time. 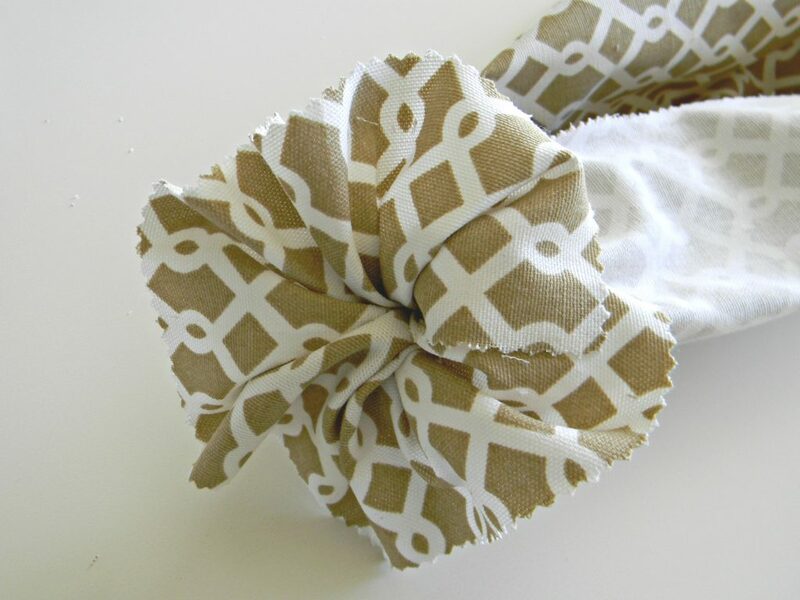 The fabric can be easily changed with the seasons or if you’re just ready for something different. I love this idea. No sew makes it even better!! Thanks, Leanne! !